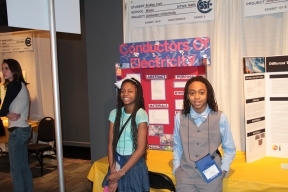 The 64th Annual Chicago Public Schools Citywide Science Fair kicked off March 21st with an opening ceremony at the Museum of Science and Industry. This year’s Science Fair featured close 300 projects completed by students across the city in grades 7 through 12. This year’s Science Fair theme was Bringing STEM (Science, Technology, Engineering, Math) Home. The Science Fair spanned the entire weekend and provides CPS students opportunities to demonstrate what science and academics means to them.